The new year has brought us a new video camera here at Tweedee Productions. And with a new camera, of course, new technology. Well, kinda. 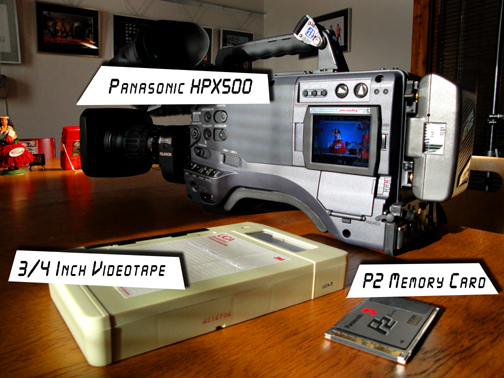 We’ve already been using Panasonic’s P2 technology for a couple of years. Our new camera, Panasonic’s HPX500EFP is actually a compliment to our well used and reliable Panasonic HVX200. Both shoot amazingly good, eye popping, high-definition 1080i video. The 500 has a few more bells and whistles, and comes in a more traditional shoulder-mount, Betacam-style configuration. So far, I love it! In addition to shooting great looking video in several HD and SD formats, there are also loads of other menu settings that allow the user to customize the “look” of the camera. When I started working my first job as a video photographer, videotape field recording had just started reaching markets like Madison, Wisconsin. Three-quarter-inch tape was the industry standard back then, employing a two-piece camera/record deck setup, and recording standard-definition video onto a 3/4 inch videotape cassette. We were able to record a whopping 30 minutes of two-channel audio and SD video (yes, in color!) onto a tape about the size of a small Gideon’s Bible. Years later one-piece Betacams came along with a smaller 1/2 inch tape cassette, then even smaller DVCPro and mini-DV tape formats with smaller cameras. Today you can record fairly decent HD video on a cell phone. So now that we are digital and tapeless, what’s next? My colleague Dan Presser and I where just discussing the “next big thing” in video production technology while getting coffee last week. You see, the weak link in the whole video aquisition-input-edit-output chain has always been the time it takes to transfer recorded media into an editing system. In most cases videotape has to transfer in real-time. With digital, large HD files may take several minutes to copy onto a hard drive. Sure, there are some costly solutions now available that will speed up the process. But what about this – a field camera/recording system that moves recorded images live, wirelessly, and as they are being recorded right into an edit system! Sound far-fetched? Yeah, well so did recording HD video onto a playing card sized device way back in 1980. A 3/4 inch videotape is much bigger than a P2 memory card.